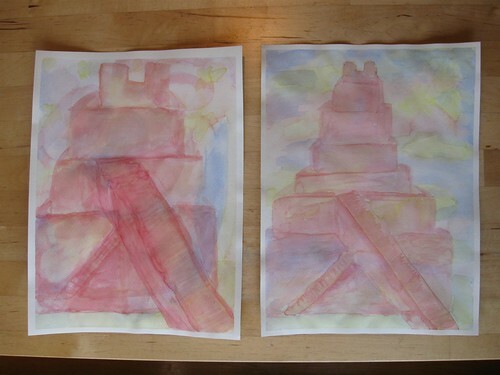 For our first attempts at veil-painting I chose to incorporate the temples from Ancient Mesopotamia and Assyria. Since this was a time of great expansion, I thought we should expand a little too and try some new art techniques. Not too shabby, I think, for a first try.... though we still have a long way to go. They are so beautiful!! And for a first try...I say!! Sara, do you know of a good book or website that explains how to do veil-painting? What you see here is the product of my looking around online and making it up. ;-) I recently ordered a dvd from Bob and Nancy's called 'Spirit in Watercolor' that's supposed to have step by step instructions. I can give a review when it arrives, if you'd like. Is it "Spirit in Watercolor?" That's the one, but like I said, I haven't actually seen it yet. I expect it will arrive next week.